Currently we have 3 layouts available for download. You can see a preview of the layouts by clicking on the screenshot. Before downloading you must agree that the layouts are copyrighted by Hell and Heaven Net. 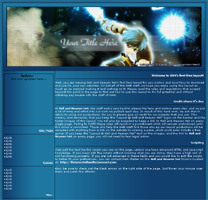 Description: This is Dark-Matter's first layout he made for HHN, It's a Star Ocean: Till the End of Time layout. It's a dark blue layout. The package include the images, PSD files to change the text, and a coded HTML file. Description: This is Dark-Matter's 2nd layout he made for HHN, It's Advent Children layout. This one is grey with a dark grey background. 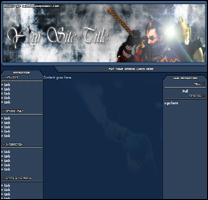 Description: This is Dark-Matter's third layout he made for HHN, It's a generic RPG layout. It's a dark blue layout. The package includes the images, PSD files to change the text, and a coded HTML file.